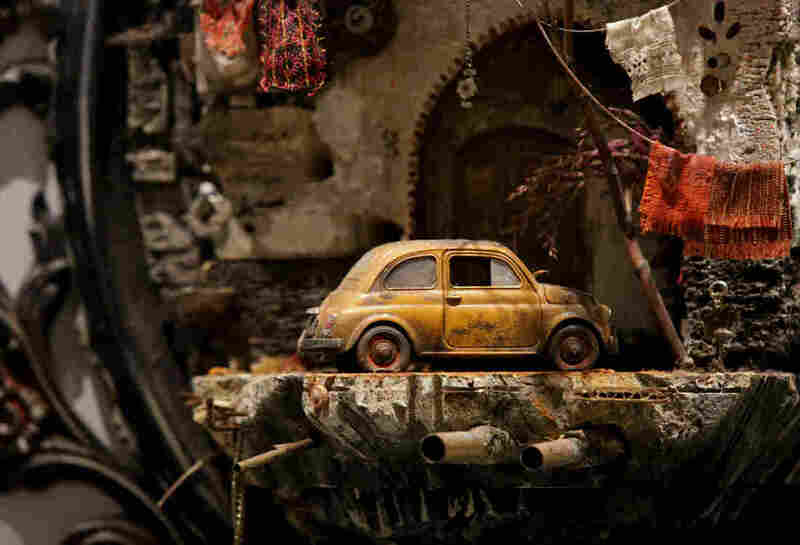 Art At Ford Foundation Gallery Depicts Perils, Portents ... And Optimism : Goats and Soda In "Perilous Bodies," a new exhibit at the Ford Foundation Gallery, artists share their vision of the injustice, from the rickety boats of migrants to missiles that look like a flock of blackbirds. A rickety-looking wooden boat is piled high with overstuffed bags covered in colorfully patterned African fabrics. Hanging overboard: a collection of toy plastic teapots and gasoline cans. Instead of floating on water, this ark is adrift on an ocean of green glass bottles. The boat is actually a piece of art called "Road to Exile," by the Cameroonian artist Barthélémy Toguo, part of a series of works examining migration and colonialism. Poised at the entrance to "Perilous Bodies," the initial exhibit at the Ford Foundation Gallery in Manhattan, it is the first stop on a journey through the perils of living in the 21st century. The boat is a piece of art called "Road to Exile" and was created by Cameroonian artist Barthélémy Toguo. It sits on a sea of green glass bottles. 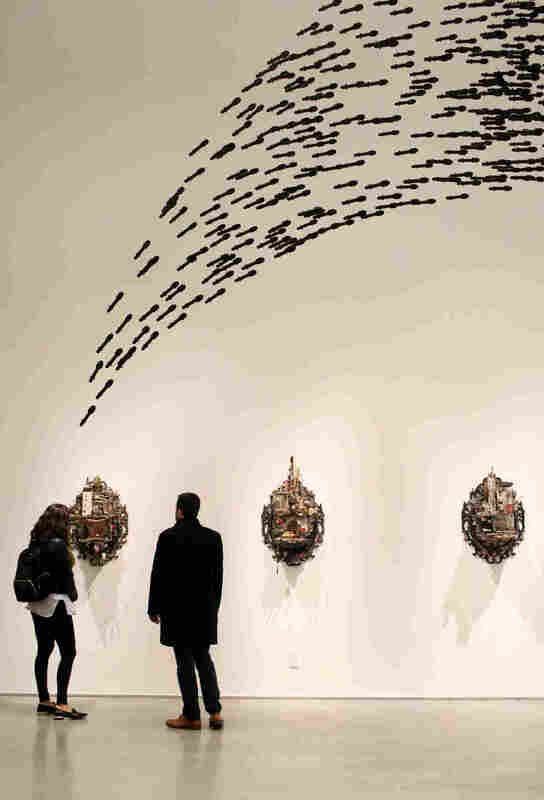 Go through the gallery doors, and swarming overhead is what at first appears to be a flock of blackbirds. Look again: These are miniature foam, laser-cut replicas of air-to-surface Hellfire missiles. Pakistani-American artist Mahwish Chishty conceived the piece, "Hellfire II," as the trajectory of a drone strike, she says. 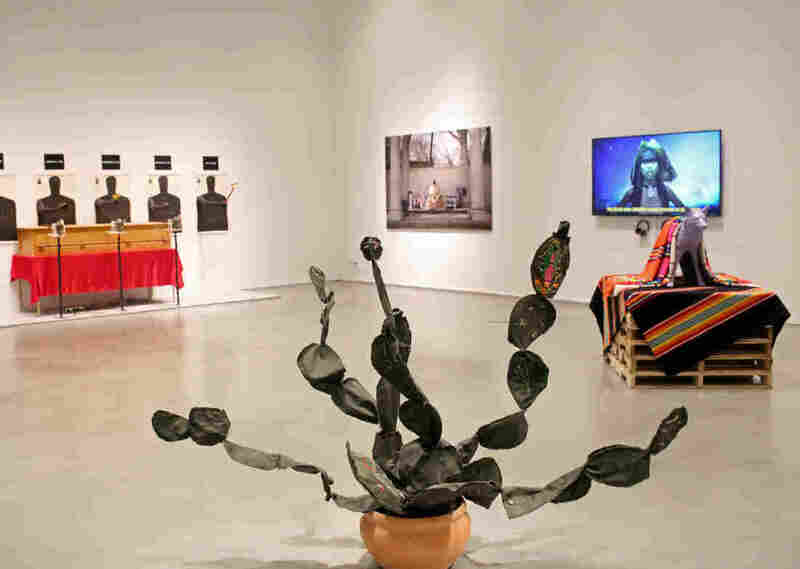 These are but two of the 19 artists whose paintings, photographs, videos and mixed-media installations fill the gallery's two rooms. Their works, from small to large-scale, all illustrate the perils of living in a world of inequality, conflict and injustice. The curators are Jaishri Abichandani and Natasha Becker. "The works here are visceral," says Abichandani. "You don't necessarily have to read the labels." But you do have to take a closer look to fully comprehend the artist's intention. An oversized tapestry at first glance resembles a planet-filled space-blue backdrop for a planetarium show. But what "The Weight of Scars" by the Nigerian-Belgian artist Otobong Nkanga actually maps is a Namibian landscape marred by the mining of minerals. 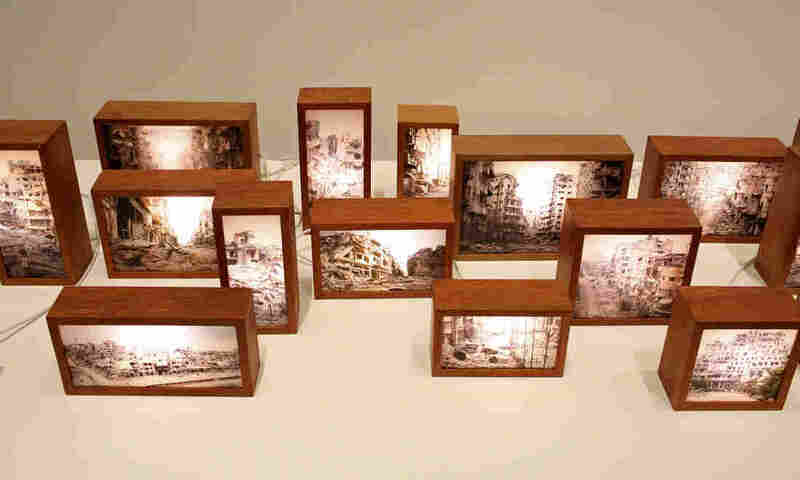 Artist Tiffany Chung constructed 31 wooden lightboxes displaying "found images" of war-torn homes in Syria — a work she titles "finding one's shadow in ruins and rubble." Bold white rope-like lines connect black-and-white photographic discs depicting images of abandoned mine shafts and cracked, fragmented land. Holding up the ropes on either side are mechanical, headless human figures. "This is a reference to the physical bodies involved in the extraction of minerals," says Becker. The tapestry as a whole, she says, evokes the scars left on the human body, the land and the abandoned communities. A separate work nearby consists of three larger copper plates, in each of which a photo of an anonymous Dalit woman from 19th-century India is superimposed against a backdrop of legal texts from the era. The purpose of the juxtaposition is to show the women's double exclusion from the legal system as both women and as members of society's lowest caste, the so-called untouchables. 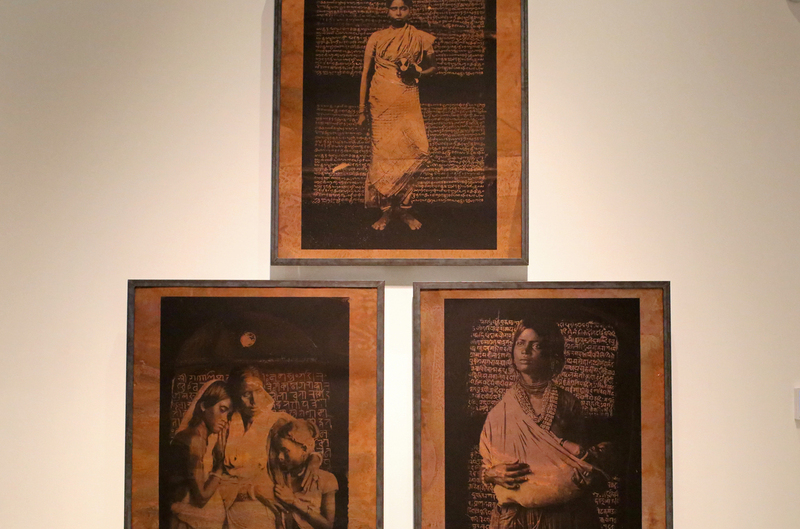 A piece showing portraits of three unnamed Dalit women is called "We are still here." Their images are juxtaposed against legal texts from the 19th century governing their lives as women and as the lowest caste in Indian society. The series is called "We are still here," explains artist Thenmozhi Soundararajan. "I did these as a testament to the courage of Dalit women, to return their dignity and put these women into an ancestral place of honor." Some of the art reflects ongoing protests against injustices. A photograph of a woman sleeping in a public park is part of "Meet to Sleep/I Never Ask for It" an ongoing safety campaign started by Jasmeen Patheja, a human rights activist and artist from India. Women volunteer to sleep outside, at different times of day and night, usually in groups, then log the time and place to emphasize their right to be safe in open spaces. A potted "cactus," sculpted out of border patrol uniform fabric, is embroidered with figures and landscapes that tell the stories of immigrants crossing the border from Central America and Mexico to the United States. 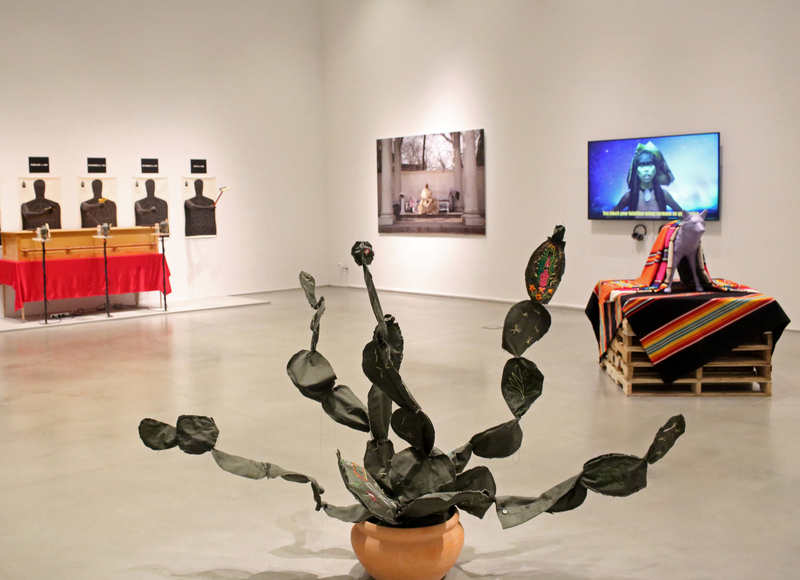 It is one of many such cactus sculptures created by "Space in Between," workshops across the country organized by Mexican artist Margarita Cabrera. She began the project in Houston nine years ago and now has about 700 collaborators, who participate in workshops in which they embroider scenes from their personal stories of crossing the border onto the fabric leaves. The fabric cactus is one of many created by artist Margarita Cabrera, who collaborates with women to embroider their immigration stories on the leaves. The idea is to use traditional Mexican embroidery crafts to allow people to tell their stories. Thus, on one cactus leaf here you see the embroidered outlines of mountains, sun, and clouds — and a trailer-truck filled with people. Another leaf unfolds to reveal a brightly colored human hand, symbolizing the hold of family. 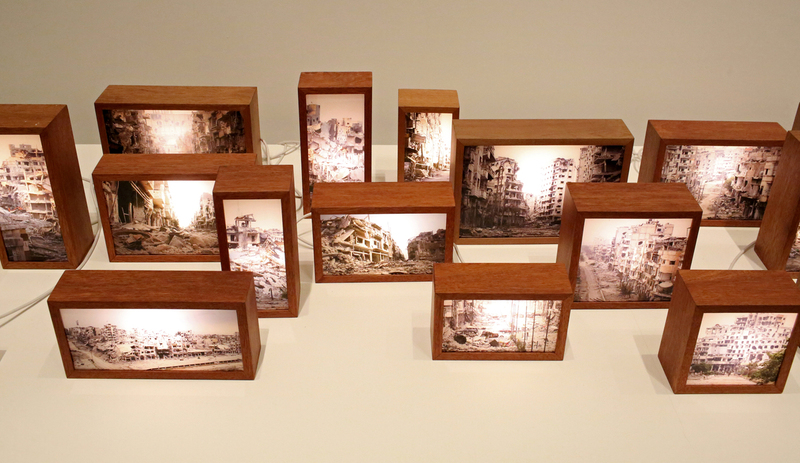 The need to connect to one's past is also present in the work of Syrian-born architect Mohamad Hafez. In "Damascene Athan Series 2017" he creates miniature streetscapes and interiors of bombed-out cities. "These works reflect my nostalgia for Syria but these scenes can apply to many cities in the Middle East, in Europe and in North Africa," he says. Adding another layer of meaning, each work is backed by an elaborate mirror frame. "The concept is that instead of seeing our reflections in the mirror, we are seeing our emotional baggage. We cannot escape our past," or history, he says. "It pops out at us every single day when we look at our own mirrors." The artist known as Dread Scott is called "The Blue Wall of Violence. 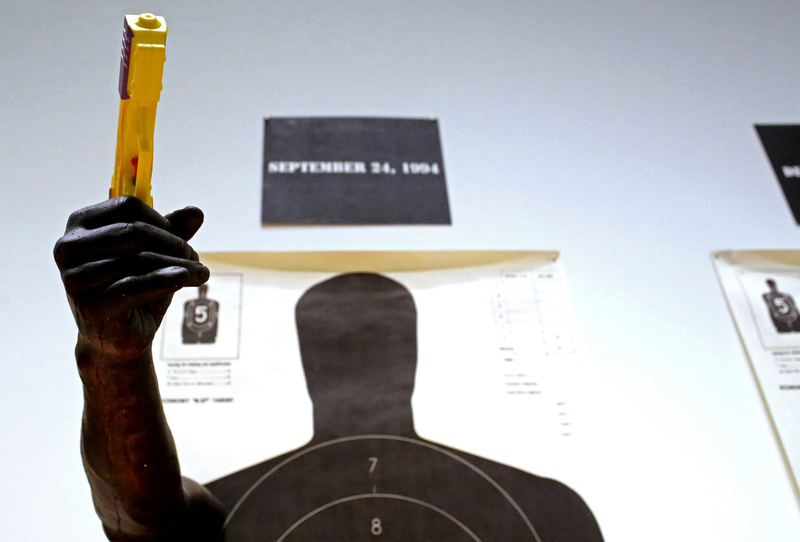 He shows six shooting targets showing what six unarmed black men were holding when shot by the police: keys, a squeegee, a candy bar, a toy gun, a wallet and nothing. Artists should "document their societies," he says. "They are ringers of bells of danger and warning" — a vision brought to life in "Perilous Bodies."